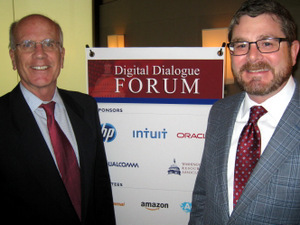 The Digital Dialogue Forum (DDF) is a non-partisan public policy coalition of world-leading technology companies. Its mission is to enhance U.S. innovation and global competitiveness through high level dialogue between business and government leaders. DDF provides a unique and effective platform to collaborate with policymakers, share industry concerns, build relationships and consensus, and advance good public policies to foster innovation and economic growth in the United States. Since its founding in 1998, the Digital Dialogue Forum has hosted hundreds of private policy discussions between business leaders, Members of Congress, Cabinet Secretaries, and senior government officials from five administrations.